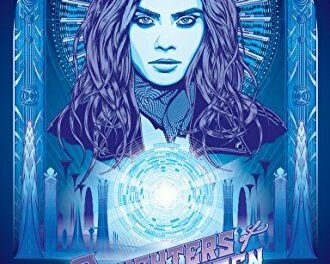 Fast-paced, foul mouthed, and packed full of adrenaline, Grigsby’s gripping tale of gritty all-female biker gangs on a deep space penal colony is an explosive one. Split between two places, Grigsby serves readers up a stark contrast in which we get to view his colourful cyber-punkesque dystopia: the narrative flicking between Earth’s Senator Dolfuse on a warring Earth headed for environmental apocalypse, and Lena Horrowitz on Oubliette, the planet’s floating space penal colony where criminal or unwanted women are sent. 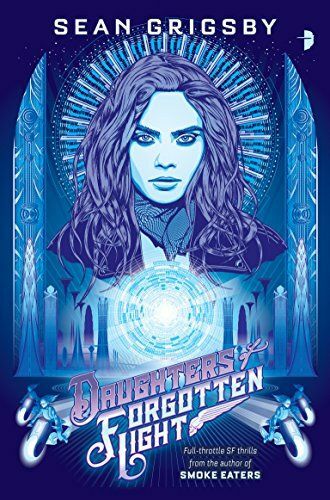 Grigsby unites these two disparate elements and their wildly different characters through a baby, Linda’s Dolfuse’s, one sent to Oubliette by mistake and found by the various biker gangs who instantly wonder what to do with it. Yet despite the various sensitive subject matters discussed and visceral descriptions given – he does not shy away from showing reader’s the darker, more violent side of Oubliette in the first few pages – this is a narrative that could venture down horrendously dark paths, but ultimately doesn’t. Grigsby makes certain to offset the grimmer moments with scenes containing light humour, and genuine emotional moments shared between characters, and has his biker gangs ride around on Tron like light-up bikes to add a bit of cool sci-fi tech flair to an otherwise unattractive slum colony. Indeed, Daughters of Forgotten Light offers up an intriguing exploration of what exactly the value of a human life means when you’re at the bottom of a societal, and literal, rubbish pile. It is an exploration of humanity, how far characters are willing to forgive or be pushed to revenge. It is about innocence, and by what means people will be driven to protect it and takes a relatively stark look at exploitation and corruption, with some not unexpected twists along the way. The characters are compelling and inclusive, as he actively includes LGBT+ individuals and disabled representation in a cast made up of fierce, strong women. Certainly, it is refreshing to read a science fiction work whose cast is largely, bar a couple of exceptions, made up of women. And whilst Grigbsy does base large parts of the plot off the assumed “maternal instinct” of women, it narratively makes sense the further into the book you read and works well for dramatic effect. Whilst the plot in some places is a little predictable, the world-building and characters are compelling enough and paced at such a dizzying speed that you’ll feel as though you stepped off a Cyclone (their name for the teched-out motorbikes). If the world of modern sci-fi needed a thoroughly good adrenaline fuelled shake-up, then this novel is the perfect place to start.